This happens both on Stack Overflow as Meta, as well as on other sites across the network. One of the ISP involved is starhub fibre. Can this be looked at and/or can Fastly be contacted to restore their services? Fastly reported some routing issues in their Singapore infrastructure on the 18th - unless anyone has had more issues since then, I suspect that these issues were caused by that outage. Let us know! 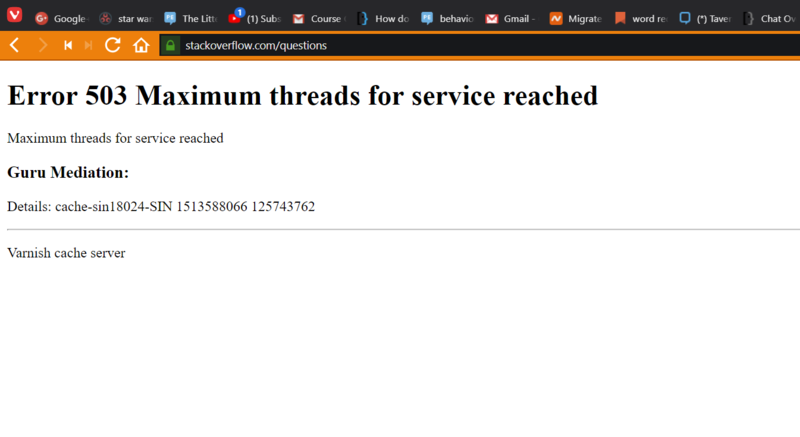 This error occurs when Varnish makes a request to a backend in your Fastly service that has reached its defined maximum number of connections. By default, Fastly limits you to 200 origin connections from a single edge node to protect the origins from overload. For the majority of sites, this should be enough. If you get this error message with less than 10,000 non-hit requests per second, make sure your origin is responding normally (e.g., there are no origin slow downs). If you just increase the number of maximum connections, you may be exacerbating the problem. If you have determined that your origin is not the issue, increase the maximum connections limit to your origin or reach out to Fastly support for further help with this issue. This error may also appear as "Error 503 maximum threads for service reached." So it's possible it's a stack exchange origin problem instead or maybe SO is so lovely and popular that the limits need increasing :-). I've added a fastly tag to grab it some attention. *At least from my perspective in the UK, I don't have an Asian proxy handy to double check the headers. Not the answer you're looking for? Browse other questions tagged bug status-completed error-message fastly .